Sherlock Holmes video games have been around since the 1980's. Here we catalogue some of the most interesting pieces from it's rich history. 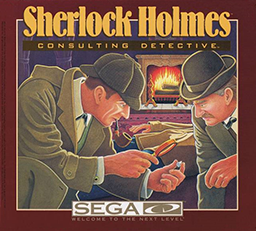 Sherlock Holmes: Hakushaku Reijou Yuukai Jiken ("Sherlock Holmes: The Kidnapping of the Count's Daughter") is an adventure game with action elements starring Sir Arthur Conan Doyle's famous detective Sherlock Holmes. It is the first of three such Famicom games from obscure Japanese publisher Towa Chiki, the next two being Meitantei Holmes: Kiri no London Satsujin Jiken and Meitantei Holmes: M-Kara no Chousenjou. Sherlock travels to various cities across the United Kingdom searching for clues behind the kidnapping of the eponymous Count's daughter. In each location, Sherlock can walk around the city and investigate suspicious locations, such as sewers and buildings. Defeating the various henchmen (or regular citizenry) roaming around the cities and sub-locations will provide Sherlock with the funds necessary to move onto the next city via the railway stations. The ultimate goal is to pinpoint where the culprit is hiding with enough clues and confront them. Sherlock Holmes: Consulting Detective is a full motion video (FMV) based video game predicated on a book-based game of the same name. It was first developed by ICOM Simulations for the FM Towns computer and later ported to DOS, Apple Macintosh, Commodore CDTV, TurboGrafx-CD and Sega CD with all versions being distributed on CD-ROM. The game uses live actors and sets as the player controls Sherlock Holmes and his longtime partner Dr. Watson, trying to solve three separate crimes by visiting various locations, listening to the dialogue, reading the included mock London newspapers, and, when the player gets enough evidence, answering the judge's questions.